Chemists at the University of Nebraska have created a humidity gauge by actually 'assimilating' living bacteria into an electronic circuit. This appears to be the first instance in which a living cell becomes a fixed part of the structure of an electronic device. Ravi Saraf and student Vikas Berry made their device from a standard silicon chip inlaid with gold electrodes. First they added a coating of Bacillus cereus bacteria, which clustered together to form bridges between the electrodes. Then they washed the chip with a solution of gold particles, each of which measured about 30 nanometres across and was covered with peptides to help it stick to the bacteria. A rise in moisture levels causes the bacteria to swell slightly, which increases the distance between neighbouring nanoparticles by up to 0.2 nanometres. This tiny separation makes it harder for electrons to hop from one particle to the next, which reduces the current flowing across the chip. A change from 20% to 0% humidity increased the current flowing through the device by 40 times, whereas the current in a solely electronic device decreases by just ten times. The bacteria must stay alive during their assimilation so that they do not leak any internal fluids and lose their shape. According to Saraf, the bacteria can survive for about two days without nutrients. However, the device continues to work even after the bacteria die; the zombie 'borg-teria' continue to work for as long as a month after death. 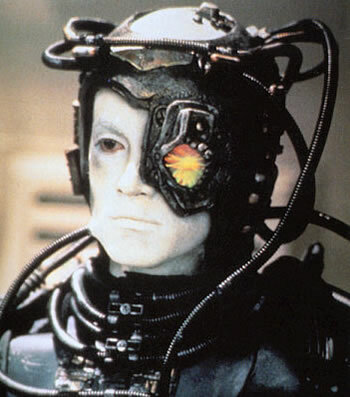 Science fiction fans are well aware of the 'cellborgs' namesake - the Borg collective of cyborgs (cybernetic organisms) who stop at nothing in their relentless pursuit of assimilating other intelligent organisms. In the series (and associated films), captured human beings are outfitted with mechanical and electrical parts that will make them serviceful to the collective. Read Cyborg cells sense humidity.